Here's something similar to the iPhone Blank Home Screen Icons I made. This will work in iOS4, however it won't be 100% transparent, since as I mentioned in the other post, Apple doesn't allow transparent icons. 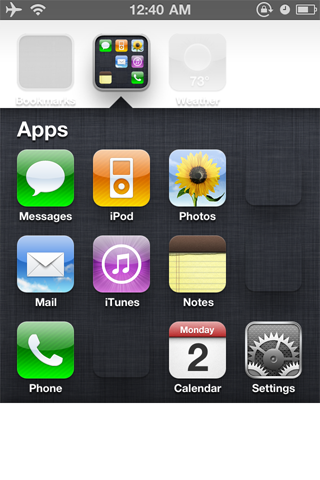 There are multiple icons since the background of folders is different for each icon position. If you want to get it the most transparent possible, you should place each icon in its corresponding position. They are numbered 1x1 (1st row, 1st col) to 3x4 (3rd row, 4th column). If you forget which place an icon belongs, you can simply open it up and it will display a number in that format. By default they will use a blank title. I like having columns (or sometimes rows) of similar apps together. I also like having my more frequently used icons near the bottom so that they are easier to reach. hi there. any chance on a tutorial on how to make this work by myself? I got another b/g I would like to cut up and use as you done and would like to place it on my own server. Having rows of similar apps is very confortable indeed. It can save you plenty of time. When I've been looking for academic writing jobs, I've been saving the pages with job offers like that.